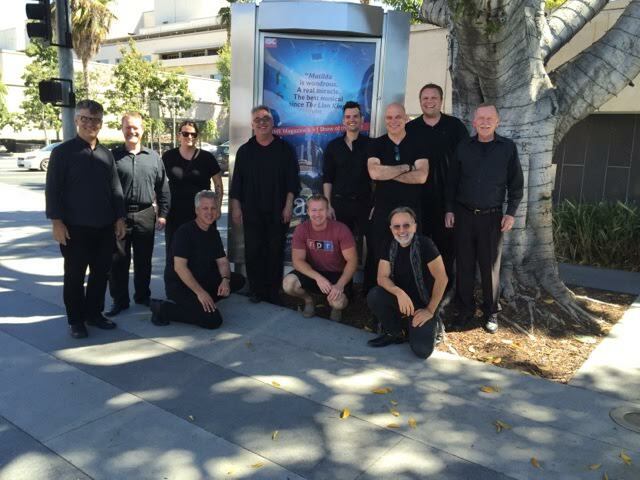 “Matilda: The Musical” Local 47 orchestra at the Ahmanson — Back row: Jeff Driskill (woodwinds), David Mergen (cello), Anna Stadlman (bass), Sal Lozano (woodwinds), Matthew Smedal (music director, Pittsburgh Local 60-471), Dan Fornero (trumpet 1), Rob Schaer (trumpet 2), Robert Payne (trombone/contractor). Front Row: Bill Congdon (assistant music director, Charlotte Local 342/Las Vegas Local 369), Joshua Priest (percussion, NY Local 802), Thom Rotella (guitar). Based on the beloved novel by Roald Dahl, “Matilda: The Musical” delighted audiences at the Ahmanson Theatre in a highly successful run May 28 through July 12. Winner of 50 international awards, including four Tony Awards®, “Matilda” is the story of an extraordinary girl who, armed with a vivid imagination and a sharp mind, dares to take a stand and change her own destiny. Written by Dennis Kelly, with music and lyrics by Australian funnyman Tim Minchin, the musical has received rave reviews from fans and critics alike. The show now continues on its U.S. national tour to San Francisco and Seattle. “I would like to publicly thank the musicians of Local 47 who played my show, ‘Matilda: The Musical,’ at the Ahmanson during the past two months. Los Angeles was ‘Matilda’s’ first stop on the road, and the musicians we picked up here in L.A. have set the bar incredibly high for local orchestras all across the country. This entry was posted in All News and tagged Ahmanson, live music, live musicians, Matilda, Matilda the Musical, theatre on July 15, 2015 by admin.